Do you love to eat out? I know I do. Well, here is some good news. You can still eat out and lose weight. Sounds impossible, huh? It’s not as difficult as you think. Just follow these tips. (1) Research – If you don’t want to break the bank, eating out healthy requires a little forethought, planning, and self-discipline. Most restaurants have their menus online with nutrition facts. I use a free app on my phone called ‘Restaurants.’ This iPhone app has a list of numerous restaurants and the calorie count of different items on the menu at that restaurant. If you know the restaurant you are going to has a dessert you absolutely can’t go without, you can cut back during other parts of your meal. I would always pick out my meal ahead of time and log it in ‘myfitnesspal’ journal, which is another iPhone app. This allowed me to keep track of how much I could eat without consuming too many calories. (2) Bread – Ask your waiter/waitress to bring out the bread with your meal. Often many consumers fill up on unnecessary calories from bread and butter before their meal and then turn around and eat what they ordered. If it comes with you meal it makes it easier to stick to only one piece. (3) Alcohol – For those of you that are of age, be careful about ordering that glass of wine or bottle of beer with your dinner. Like I have said before, the empty calories in alcohol can add up. So if you decide to drink with your meal, skip dessert. You can have one or the other, but I suggest not having both. (4) Salads – Order smart salads. Ask for your dressing on the side, it could save you 100 extra calories. Salads piled with cheese, croutons, and dried fruit can take away from the healthy aspect of having a salad before a meal, so don’t be afraid to customize your salad to make it healthier. (5) Main Food Choices – Go for fish or lean meats and pick healthy sides! Order vegetables instead of French fries and you’ll save big time. Often restaurants have a section of the menu dedicated to those health nuts, so use this to your advantage. 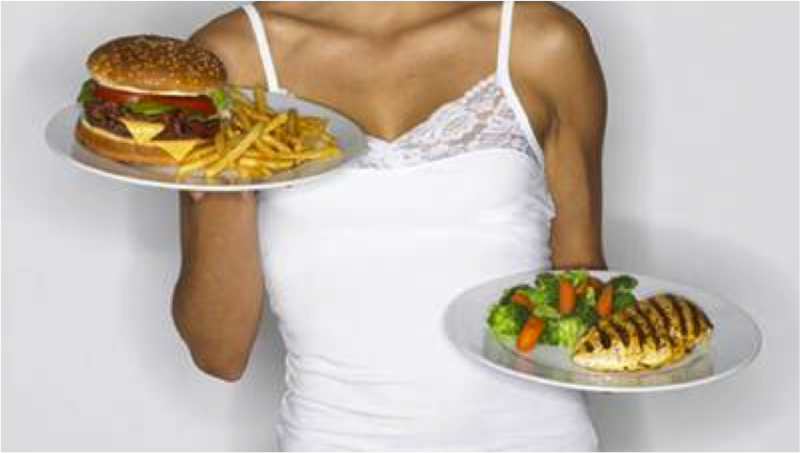 (6) Portions – Decide how much you are going to eat before you start eating. When eating out, one plate of pasta could be enough food to feed you for three different meals. Maybe box up half of your meal ahead of time; if it’s not in front of you, you won’t feel the need to eat it. (7) Desserts – Share your dessert. You can still satisfy that sweet tooth, but I wouldn’t suggest keeping that massive slice of cheesecake to yourself, well unless it’s your birthday then go right ahead. 😉 If you eat out every night, keep desserts to once or twice a week. Here is another helpful tip. When ordering coffee ask for nonfat milk instead of using whole milk or cream. (8) Order Errors – Don’t be afraid to send a dish back if it didn’t come as you ordered. If your salad didn’t come with the dressing on the side, speak up. Don’t sabotage a week’s worth of hard work at the gym. The goal is to leave any restaurant feeling satisfied. Train yourself to crave healthy foods!